White stripes 3” Record Set With Inchophone 3” Record Player. Condition is New. Shipped with USPS Media Mail. 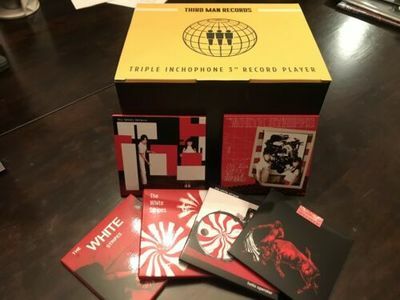 Third Man Records exclusive Crosley RSD3 MINI Turntable w/ 6 White Stripes 3” singles, new in box! Singles box was opened for photo, player has not been touched! Will be shipped Priority mail and insured for full purchased price.